Hainan Island Jianfengling Tropical Rainforest National Park Travel Guide, Day tour to Hainan Island Jianfengling Tropical Rainforest National Park. 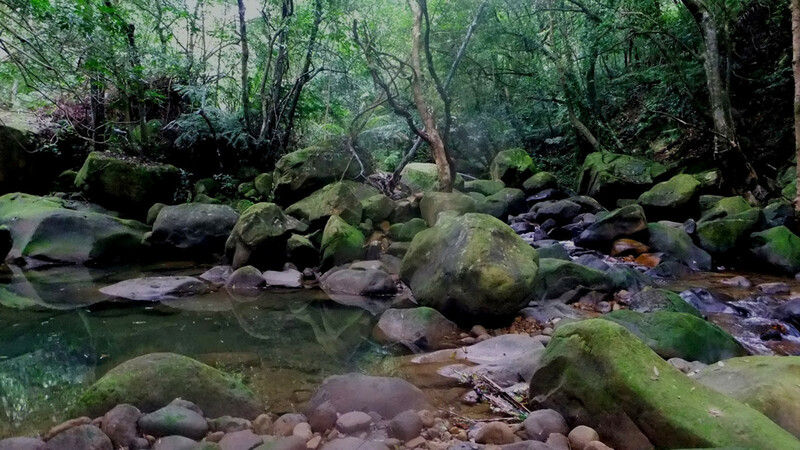 Hainan Jianfengling Tropical Rainforest National Park is located in the southwest of Hainan Island, about 90 kilometers away from Sanya City by high way and a short local road. 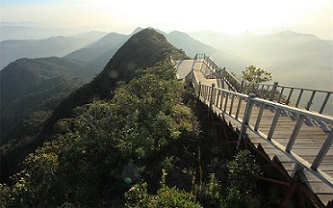 Jianfengling National Forest Park is the largest and best-preserved tropical original forest in China. It has another name: the Amazon Rainforest of China and was chosen as one of the top ten most magnificent forests in China by China National Geography Magazine in 2005. There are high speed trains running daily from early morning till late afternoon from Haikou Station, Haikou Meilan Airport, Haikou Downtown, Sanya Train Station, Sanya Phoenix International Airport and any other parts of the Island by Hainan Loop Train. The Hainan Jianfengling Tropical Rainforest Park is about half an hour away by local shuttle bus from Jianfeng Train Station to main gate of Hainan Jianfengling Tropical Rainforest Park. To reach your hotel at Hainan Jianfengling Tropical Rainforest Park, please book pick up service with the hotel you book, then the hotel will arrange pick up from the main gate where you pay admission (CNY60/person). But if you just go for day tour, the easiest way is to book our private round trip transfers at CNY1000/way by private car (Max. 3 adults) or CNY1500 for max. 7 adults for day tour. Part One: Tianchi and its surrounding area for lakes, waterfall, bird singing, tropical plants, flowers and more. Tian Chi literally means “Heaven’s Lake”. As expected, its extraordinarily serene surface creates a perfect reflection of the sky – as well as the rainforest-covered mountains – above. 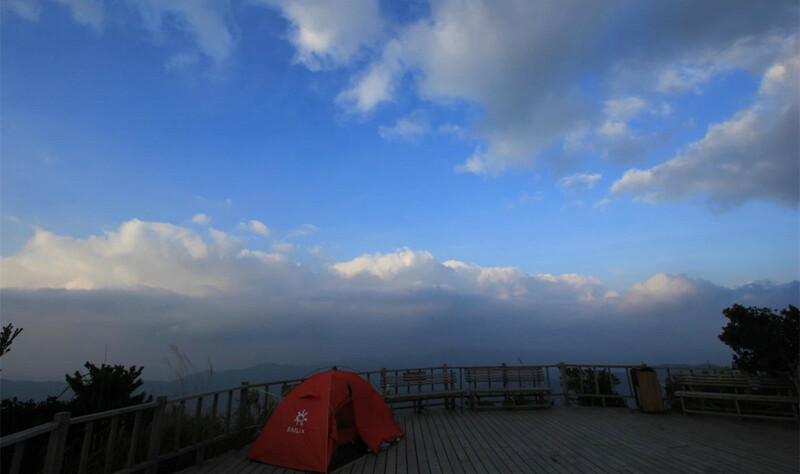 The other part is to climb the Jianfeng Main Peak: it takes about two and a half hours to climb to the 1,412m-high mountain peak. 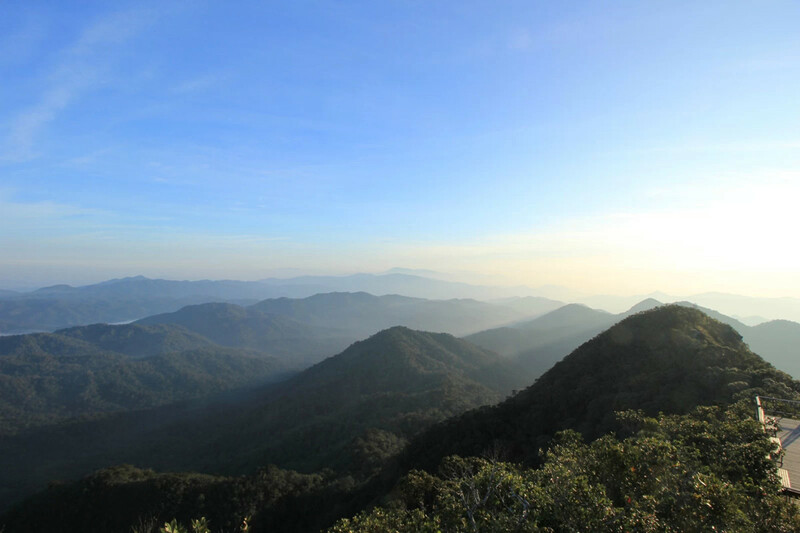 On a clear day, climbers will be rewarded with a dynamic view of the fantastic rain forests, especially at sunrise or sunset. 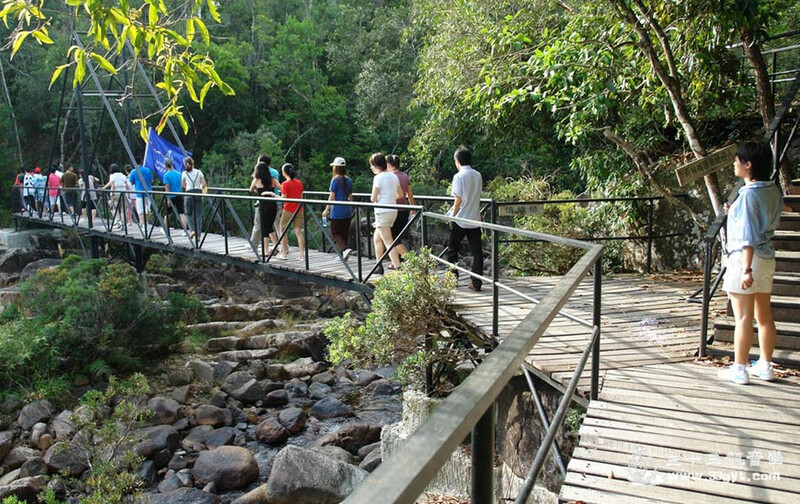 For most tourists, an easy walk in the Mingfenggu Valley is the highlight of the day tour. Located not far from the Tianchi Lake, Mingfenggu is known for its variety of birds, such as rare peacocks, hawks, egrets, original chickens, and many more. In addition, the large collection of precious plants is an attraction. The plants here include large quantities of living fossil ferns, which have appeared since the dinosaur age that coexisted with rare birds. 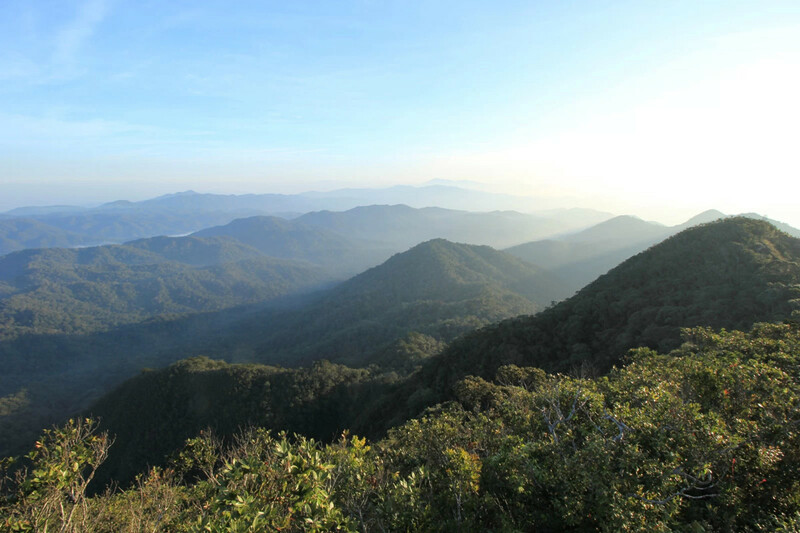 November till April is the best time to visit Jianfengling Tropical Rainforest National Park as the weather will be pleasantly cool so you can appreciate the most beautiful landscapes on more sunny days. It rains a lot during the raining season May till October. Our private tour costs CNY398/person (min.4 pax/trip) with round trip private transfers, and admission fee or CNY1180 for 2 persons group and CNY1380 for 3 persons group. If you want a professional tour guide, it costs CNY800/day. 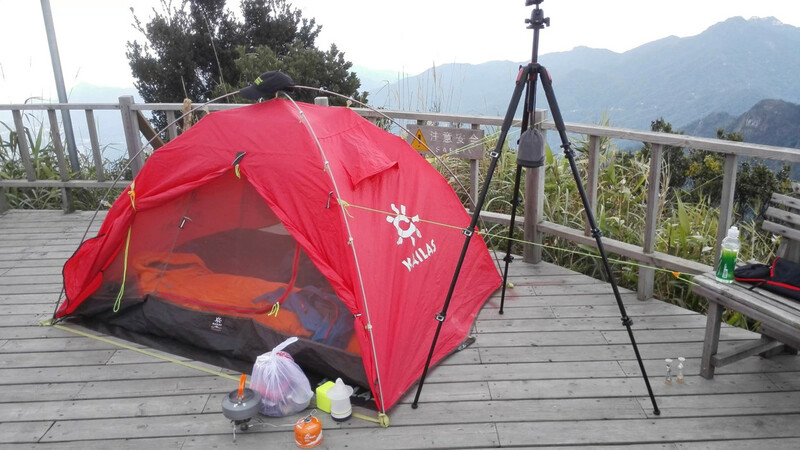 Day 1: After arrival, climb Jianfeng Peak, then check in the hotel, free & easy. Day 2: Mingfenggu Valley Walk, then check out and back to Sanya at around 1pm. Jianfengling Tianchi Hotel尖峰岭天池避暑山庄: Thoug the name comes with Tianchi, but actually the hotel is 3 km from Tianchi Heaven’s Lake, AND the Hotel is at the entrance to the Mingfenggu Valley. There are about 30 rooms for a budget stay in Jianfengling: twin beds or double beds, a TV with Chinese channels only, a kettle and en suite bathroom with wash basin, western toilet & shower with hot water heaters and 24 hours hot water. Tianchi Resort is our recommendation for budget stay in Jianfengling. Standard room from CNY300/night, and deluxe rooms upstairs in the reception building at bigger size, better views costs CNY480/night with Chinese breakfast included. Jianfengling Tianchi Taoyuan Hotel乐东天池桃园酒店: So far the best resort up to 4 star quality on the lake. We would recommend this Tianchi Taoyuan Hotel if you wish to have a better standard stay in Jianfengling. It is right on the Tianchi Lake with great mountain, and lake view. Standard double/twin room with lake/mountain view costs CNY888/night with breakfast included. Answer: Normally we recommend 8:00am-9:00am. It will take you around 2 hours to the entrance. question: Where to have your lunch/dinner? Answer: Our driver will recommend you a local restaurant to have your lunch. 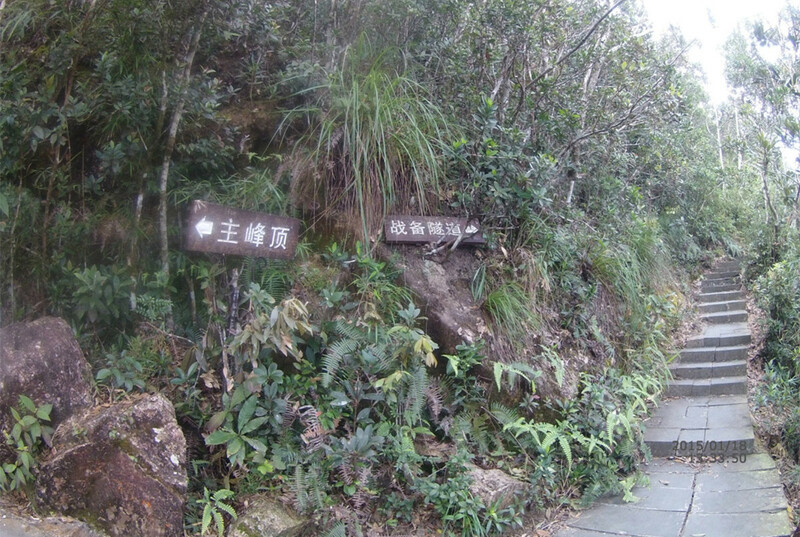 Jianfengling Tropical Rainforest National Park Travel Guide, Day Hiking Trip to Jianfengling, Jainfengling Bird View Trip.